I need to let you know that I can't take credit for these scallops... I may have found the recipe, but my husband is the one who executed them perfectly. From making clarified butter and expertly searing the scallops to the perfectly seasoned sauce and beautiful plate, complete with garnish, it was all him. You may remember that I'm not a big seafood eater but I do try it whenever Jon orders it at a restaurant, and we sometimes cook it at home. Several months ago he had a really good ceviche at a restaurant and I couldn't get enough of the scallops - I've been wanting to try making them at home ever since. 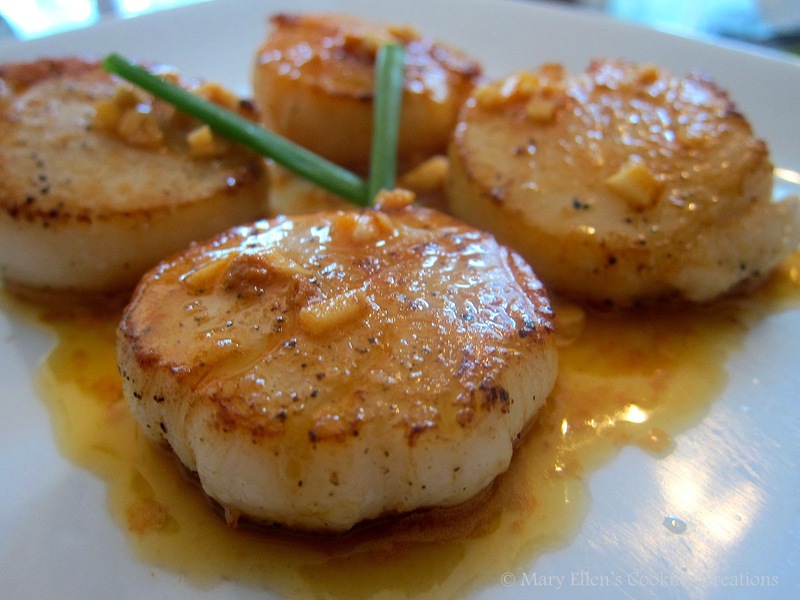 A few weeks later a recipe popped up in my feed that I immediately bookmarked - this one for Seared Scallops with Garlic Chile Butter comes from one of my favorite blogs, Annie's Eats. So when Jon suggested scallops on Saturday, I immediately pulled out that recipe. He's the one with experience cooking scallops and most seafood, so he took over this one. I love that he likes to cook and that he's good at it, and boy did he impress with this one! The first step in the recipe was to clarify your butter - clarified butter doesn't burn as fast as regular butter so it's great for sauteeing. This is something that neither of us had done before, so he looked up a few different methods. He ended up melting the unsalted butter in a pan and then skimming off as much of the foam (milk solids) that he could. Then he poured what remained in the pan (the clear golden liquid) through a coffee filter that he put in a small mess strainer. He got about 4 Tbsp of clarified butter out of one 8 Tbsp stick. Once that step was done, the recipe was a really quick and easy one. The scallops cook in just a few minutes, and the sauce also took only a few minutes to make. I loved the crust on the scallops, but the sauce is what made this dish - slightly sweet, spicy, and aromatic from the garlic. The original recipe called for a sweet chile sauce but he used Sriracha and I'm glad he did - the sauce would have been to sweet on naturally sweet tasting scallops. The only change he'd make next time is the put the garlic through a garlic press instead of mincing it. Otherwise this recipe is perfect. In a small bowl, combine the room temperature butter, chile sauce (Sriracha) and garlic. Season with salt and pepper and mix together until evenly blended. Set aside. Heat a large skillet on medium-high for 2 minutes. Add the clarified butter and swirl to coat the pan. Add the scallops to the pan in a single layer and let cook without flipping or stirring for 2 minutes. Flip the scallops over and cook for 1 to 2 minutes more, just until cooked through. Remove the scallops to a plate. (Jon's note - start with less butter as the scallops release a lot of water when they cook. You don't want your pan so full of liquid that you can't get a good sear on the scallops). Add the wine to the now empty pan to deglaze any browned bits from the bottom. Reduce the heat to medium-low. When the wine has mostly bubbled off, add in the chile butter mixture and stir until just melted. 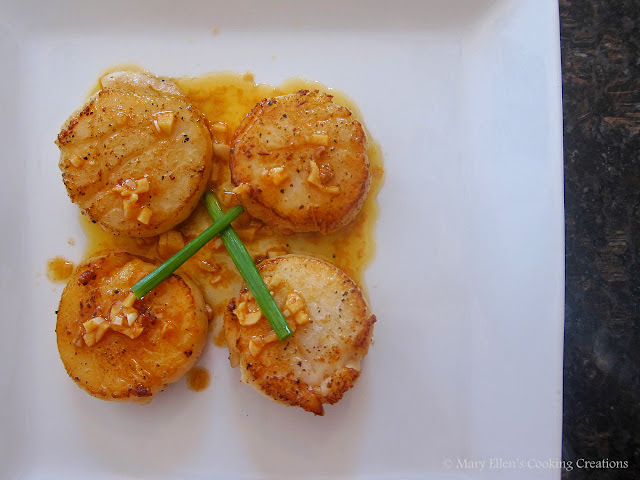 Serve the scallops warm with a bit of the butter sauce drizzled over the top.